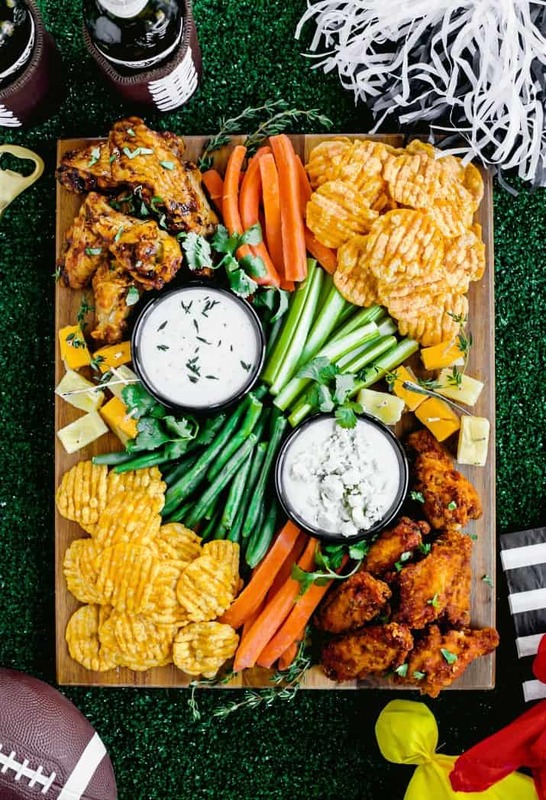 Make a Football Party Snack Board with classic and delicious game day party food. I’m combining quick and easy party appetizers with some lighter football snacks for an appetizer board that pleases the palate. Whose ready for the big game? As usual I’m ready for the half time show, the commercials, and the food! I’m not much for the game itself but I love to eat and drink my way through it. And this year all eyes will be on this game day snack board. I’m serving up three flavors of Bold & Crunchy popchips ridges alongside crudites and chicken wings for a snack board you can enjoy during the game. For even more ideas don’t miss these game day snack ideas with diy snack cones. A ‘Big Game’ party usually requires all the guests to bring something along to share. And as we know, those party foods are typically indulgent and calorie laden. That’s okay! I totally endorse cheat days, or free food days, or however you like to phrase it. Living a joyful life is all about moderation and balance. With that in mind I piled my football themed snack board full of delicious appetizers and snacks. Chicken wings are the quintessential game day party appetizer. They’re easy to pick up and eat, and they come in a multitude of flavors. Classic buffalo wings are a must, but these brown butter honey wings add another delicious flavor profile. With these two recipes you get a dry, breaded option as well as a saucy option. Other options that would be just as welcome are these teriyaki chicken fingers w/ peanut dipping sauce and these football party food pigskin poppers. I’ve added the two different flavors to my football themed snack board, and placed them at opposite corners to help frame the wood board. It’s a good trick of the trade that keeps the eye moving. No party is complete without a variety of fresh vegetables, or crudites. They give a healthy alternative to the spread, as well as act as a palate cleanser between bites. Choices here include carrot sticks, celery sticks, and green beans. The beans are slightly steamed so they’re not raw but still have a firm texture and crunch. Add two dips that will accommodate the chicken wings and the vegetables for dipping. Obvious choices are blue cheese dressing and ranch dressing. HOSTESS TIP: Add some crumbled blue cheese to the blue cheese dressing to pump up the flavor and texture. I’m a chip junkie so every football party has to have some crispy crunchy chips! Here I’ve included popchips Buffalo Ranch ridges and Cheddar & Sour Cream ridges. These are terrific to add to your snack board because they’re baked, not fried. They’re gluten-free and kosher. And certain flavors are non-GMO and contain no artificial ingredients. The Buffalo Ranch flavor is bold and spicy! A great addition to football parties. While the Cheddar & Sour Cream are classic and smooth. My personal favorite flavor is the Tangy Barbecue Ridges that are not too spicy but full of bbq flavor. Be sure to purchase these at your local grocery store or online HERE. Be sure to set the scene for your Big Game party with lots of football themed paraphernalia. This is the fun part! Head out to the DIY home store and have a piece of turf grass cut to size for your table topper. You can find this in the rug section, and it’s quite inexpensive. Use tissue tassels from party banners as “pompoms.” I like the neutral look of black and white but you can certainly use the colors of your favorite team. Black and white striped napkins echo the look of the referee’s uniforms, while yellow napkins are like that of the penalty flag. A football is a no-brainer for this party decor. I love the look of these vintage style footballs that you can find in your team logo. You can find more football party decoration ideas here. Who are you pulling for in the big game? Pin these ideas and remember, sharing is caring! This post is sponsored by BabbleBoxx .com on behalf of popchips. Looks super delicious!! Love the spread!